How To Create Anchor Links In Blogger - Hallo sahabat Information About Blogger, Pada Artikel yang anda baca kali ini dengan judul How To Create Anchor Links In Blogger, kami telah mempersiapkan artikel ini dengan baik untuk anda baca dan ambil informasi didalamnya. mudah-mudahan isi postingan Artikel Blogger Tips And Tricks, yang kami tulis ini dapat anda pahami. baiklah, selamat membaca. Have you ever heared about anchor links? Maybe you are not aware of it as only a few of bloggers use this great thing to make their posts impressive and easier to read. Anchor links are the links which takes you to a specific part of page, just like back to top button takes from end of the page to top of the page. Similar to back to top button now you can create anchor links in your blog posts and help visitors to navigate to specific part of post. There is no need of any gadget or widget for creating anchor links, you can do it by using Html codes. Anchor links makes it easy to find a specific topic on a page. Anchor links are helpful for visitors to reach to what they are looking for and skip the rest. These links makes your posts impressive. Anchor links makes your blog posts easier to read and makes your navigation more good. Don't miss: Stylish back to top button for blogger. See a demo of anchor links by clicking here.It will take you to the bottom of page. 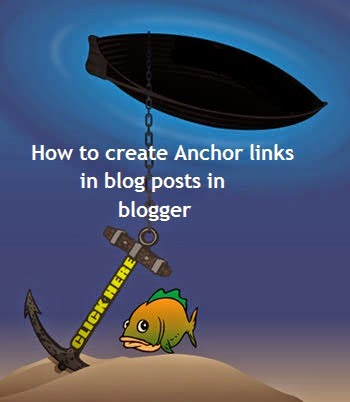 In this post I will show you how to create anchor links in blogger. 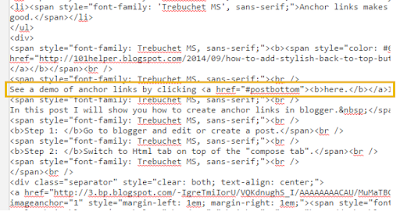 How To Create Anchor Links In Blogger ? Step 1: Go to blogger and edit or create a post. Step 2: Switch to Html Editor from "Compose Editor" as shown in below image. Step 3: Choose a location in the post where you want to jump and where you want anchor link to appear. (1). To target a part in post(setting location). 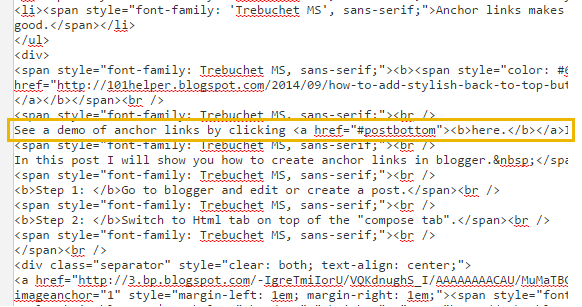 Place the above piece of code in the Html tab of your post where you want the anchor link to appear. Make sure not erase hash(#) from the code and there should be no space between hash and the target. The above code specifies the location of the target. So when someone will click on the target you set in above code(1) he will reach to the position where you paste this code(code # 2). For better explanation I am using example of the demo I've used in this post(which takes you to the bottom of the post). The above code represents a target named(post bottom) and here. is link, now I have to set the location where the page strikes, so I have used the following piece of code at the end of the post. In both of the above codes <b> and </b> represents the bold text that's why in this post the word here and the sentence You’ve reached the bottom of the post both are bold. Step 5: After setting targets and links just click on publish and you are done. If you have any problem related to this post ask me in comments. If you have any suggestion or opinion share it with me, follow and subscribe to newsletter to get instant updates about blogger tricks. Thanks for visiting 101Helper. Share this post with your friends and help me spread my work. Search tags: How to create anchor links in blogger, How to create anchor links in blogger easy tutorial, Jump to specific paragraph of post in blog, Jump to specific heading of post in blogger, how to set jumps in blogger posts, blogging tricks, 101Helper blogging tricks for bloggers. Thank you for visiting the article How To Create Anchor Links In Blogger hopefully always provide useful information, see you in another article. 0 Response to "How To Create Anchor Links In Blogger"